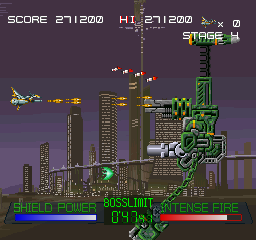 Techno Soleil was a small start-up company during the PlayStation era, and their first game Gaia Seed is a simple sprite-based 2D shoot-em-up – functional but sweet, unreleased in the west and mostly overlooked by importers. 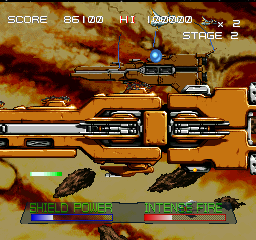 In fact most of Techno Soleil’s games were overlooked in the west. They either had a small English release (Tall: Infinity), or never came out at all and received only slight attention, like Rapid Angel. Techno Soleil is one of a myriad of underdog developers which put out a few interesting-but-ignored games before seemingly disappearing. You have a single ship choice and three difficulties. Gaming veterans will want to start on HARD, which differs only slightly if at all from NORMAL, and isn’t particularly challenging anyway. You get two extra credits in NORMAL, for a total of 5, which is ample if you want to credit feed your way to the best ending. No one should touch EASY, since it limits you to reaching Stage 4. There are 7 stages with 3 possible endings, none of which are affected by credit usage. Power-ups consist of 2 main shots (RED and BLUE), 2 sub-weapons (YELLOW and GREEN), and an eIntense Shot’ based on your main weapon which basically acts like a Power Bomb. Main weapons stack up to 3 times (RED: starts on 1 shot then 2, 3 and finally 4 shots), sub-weapons don’t stack. Lose a ship and you lose your sub-weapon, while your main weapon goes down one level. BLUE is the Laser Shot, a straight line weapon with strong frontal attack which increases in thickness and power as you stack it. 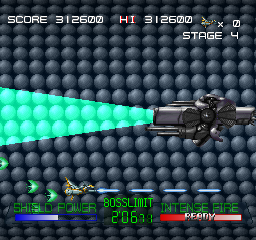 The laser’s eintense shot’ is a massive sausage of light cutting across the screen and wiping out all in its path. RED is Needle Shot. This is your typical V-shot weapon. Less powerful than BLUE, but when stacked 3 times has a wide ranging spread. The intense shot is a series of blue homing orbs target enemies and weak points on bosses, making this the best main weapon. GREEN is the Cipher Wave, the best sub-weapon since it fires four blobs which home in on enemies and can attack craft which are behind you, which is essential during boss fights. YELLOW is the Energy Blaster and acts like an additional V-shot weapon. Absolute rubbish. With such a simple weapons set most players will opt for a RED and GREEN combo for the game’s duration. Which isn’t a criticism. Gaia Seed doesn’t distract you with superfluity; it’s functional, with a focus on dodging and shooting. 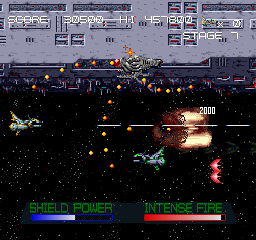 What’s especially cool, and sets it apart from other shoot-em-ups, is that both your health bar and Intense Shot bar are continuously recharging. This effectively gives you infinitely spawning power bombs and infinite health – but it doesn’t break the game’s balancing. 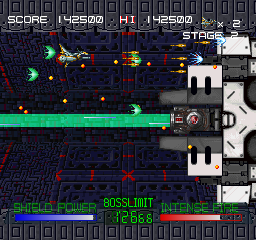 Enemies frequently use screen-filling beam-based draining weapons, forcing you to let off a volley of shots and then scramble out of the beam’s attack before your life is fully drained. With bosses this creates some intense battles of endurance – especially if you’re trying to beat them by letting the timer run down (those are some pretty intense 120 seconds). After escaping a draining blast you can lick your wounds at the screen’s edge, healing while avoiding bullet patterns. The patterns are fairly busy but without ever reaching danmaku levels of weaving. 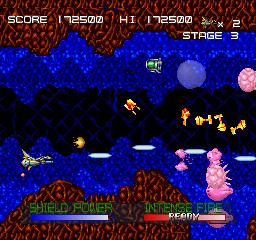 A slight comparison could be made to Deep Blue on the PC Engine, which had a recharging health bar and encouraged enemy avoidance (as pointed out by Mag Weasel). A mention must go to Gaia Seed‘s timed bosses. 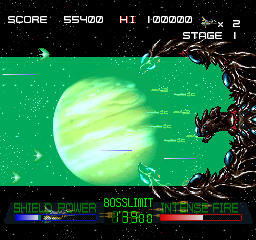 Defeating them by letting the timer reach zero doesn’t do much during the main game apart from giving you a sense of accomplishment, but if you want to see the best ending you’ll let the two final Stage 7 bosses’ live. Visually almost everything is sprite based, though it varies in terms of quality. 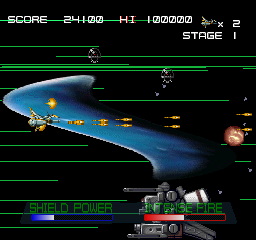 The first stage contains hundreds of massive though pixelated objects moving around, while the second has some interesting Mode 7 styled screen rotation effects. 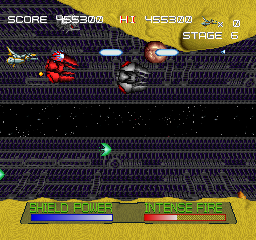 Stage 3 contains some decent parallax scrolling, though not as good as in Thunder Force IV. Subsequent levels are reasonable but without flair. The stand out element of Gaia Seed though has to be its soundtrack, which almost warrants download alone. It’s extremely unconventional, being a blend of ambient music with chanting, classical music, hip-hop and thumping techno. Stage 2’s track almost sounds as if it’s been taken from Panzer Dragoon Saga. It’s eclectic, strange, and very good. The sole composer was Xacs Ishikawa, also known as Naoto Ishikawa, a fairly obscure composer connected to works like Psyvariar and Touhou. Interestingly, he also collaborated with Harumi Shiina to remix Koji Endo’s King’s Field soundtrack, to create an album called Invitation to the Graveyard ~ King’s Field I Arrange Collection. And that’s pretty much it. Gaia Seed is not a genre defining game, and besides a few minor good ideas it doesn’t defy any conventions. 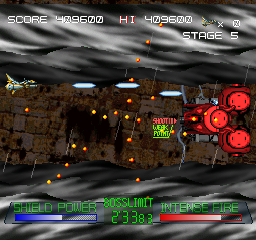 The worst that can be said of it is that in the context of 30 years worth of shoot-em-up development, there’s quite a few bigger, crazier, and more flamboyant examples. In many ways its simplicity is a boon – the perfect antithesis to the complexity found in latter day shoot-em-ups, from Radiant Silvergun through to Cave’s best offerings. Overall, it’s a little simple, but still fun. 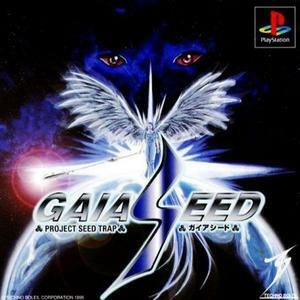 Gaia Seed originally had a limited print run, resulting in Japanese resale prices above the $150 mark. Thanks to Japan’s PSN service though, most of Techno Soleil’s back catalogue became available in 2010 for only a few hundred Yen. In winter 2010 it was finally made available in the USA through the efforts of Monkey Paw Games, who aim to republish Japanese games in their original format, unchanged, on the US PSN. While mostly irrelevant for gung-ho fanatics who’ve already bought the best the Japanese PSN has to offer, it does make these games casually available to the curious for the reasonable price of $5.99.